One of the fastest and most effective ways to convey safety information in a facility is by using visual signs. When walking through most workplaces, you’ll see a number of different signs that help people stay safe. Everything from letting people know where a fire extinguisher is located to instructing people to wear their personal protection equipment can be done through signs, which is why they are so popular. A growing number of companies are investing in printers that can create custom safety signs, which can be used throughout the facility. Having one of these printers on site provides the facility with many great advantages, including the ability to quickly create new signs as the need arises. This signs can also look and say exactly what is needed, rather than having to rely on the generic signs that are typically sold by third parties, or paying the extremely high prices for custom sign printing. One of the most common ways facilities print custom signs is by using a label printer that has the ability to print off large labels. Printers from companies like LabelTac allow companies to print directly onto a variety of labeling materials, which look far better, and last far longer than simply printing on paper. It is important to get a label printer that allows for large enough stock to be used, so that the signs can be the desired sizes. Of course, the label printers can then also be used to print custom labels for the facility, which can help to save money and improve the way things are done. With this in mind, it is very important to choose the right printer based on the specific needs of the facility. While looking at different options, consider not only what needs to be created today, but also what could be needed in the future. These industrial label printers can last for many years, and it is always best to invest in a model that will meet the needs of the facility for years to come. 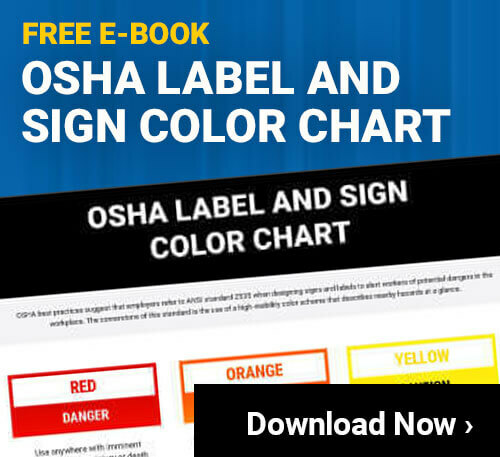 When shopping around for the right printer to create signs and labels for your facility, you’ll quickly discover that there are many makes and models available to choose from. Finding the right one may seem overwhelming at first, but by taking the time to look at the strengths and weaknesses of each option, you should be able to identify the right one for your specific situation. For example, looking at some of the most popular options in the LabelTac lineup, you can see how to properly evaluate each printer. LabelTac 6 Label PrinterThis printer is easy to operate and is built to last, even in a rough environment. It can print labels and signs that are up to 6’’ in width, and allows edge-to-edge printing which can help improve the appearance of signs. It also prints at 6’’ per second, which is quite fast for any label printer. On the down side, the size will limit the types of signs that can be printed, as some will need to be larger than six inches in width. For most jobs, however, this model will be sufficient, and it will save money over the higher end options. LabelTac 4 PRO Label PrinterThis is one of the most common label printers on the market for commercial use, and it is a very effective choice. While it only prints labels that are 4’’ tall; that is often large enough for the majority of jobs. Some facilities have printed larger signs by combining two labels right next to each other, but that can be difficult to get right. When you’re looking for an affordable option, however, this one is a great choice that is inexpensive, yet still very effective. LabelTac 4 Label PrinterThis printer is very similar to the LabelTac 4 PRO, but with slightly fewer features. Companies looking to save money, while still needing to be able to print off high quality labels and smaller signs may choose to go with this option. It is still able to print off quality signs, but isn’t quite as fast or convenient. As you can see, it only takes a few moments to look at the different features of a printer, and weighing the advantages and disadvantages. Finding the right printer shouldn’t take too long when you look at each option objectively. Another great thing to consider when looking at different label and sign printers are existing customer reviews. If you can find honest, objective reviews about the printers you are considering, it is possible to get some great insight into which one will give you the performance you need, at the price your company can afford. Depending on the type of printers you’re looking at, you can often find reviews on manufacturer’s sites, as well as third party retailers that sell the specific printers you are considering. It is well worth it to take the time to locate these reviews, and read them for yourself. While label printers are commonly used to create signs in many facilities, it is also possible to purchase an industrial sign printer that is designed specifically to create signs. Some companies find that it is better to have one unit for printing labels, and another for printing signs. Deciding what makes sense for your facility shouldn’t be too difficult. There are some significant advantages, as well as disadvantages of going with a dedicated sign printer for your facility including the following. The following are some of the most important benefits you’ll enjoy if you decide to purchase an industrial sign printer for your facility. More Size Flexibility – Most dedicated sign printers will be able to print much larger signs that a normal label printer. This allows for added flexibility in designing and creating signs for your facility. Alternative Print Medium – Many sign printers can print on a variety of different mediums, including more rigid options. This can be important in some situations when working with larger signs, or signs that will be placed in areas where they may get damaged. Fewer Outsourced Signs – For companies that go with a label printer for their sign printing needs, there will often be some signs that still need to get outsourced to a third party printer. Those extra large signs, for example, that can’t be handled by even a large, industrial label printer. When you go with a big sign printer, this happens less frequently, which for some companies can be very important. Of course, there are also a number of disadvantages to purchasing a dedicated sign printer for your facility. The following are areas of concern that you should think about before going this route. Price – The price of a dedicated sign maker is typically a lot more than a label maker. Even when comparing top of the line label makers, the sign makers can be twice as much, or more, in price. Need for Two Printers – When you go with a dedicated sign printing machine, you’ll also need to purchase a label printer for the labels you require. This means you’ll have to maintain both machines, and have the physical space to set up and use both machines. Larger in Size – Depending on the specific model you choose, sign making machines can be quite large. Whether you put them in their own room or section off a space for them, the area where they are used can’t be used for other things. Limited Uses – While being able to print off signs is a great benefit to any facility, a dedicated machine is much more limited in what it can do. For many facilities, it is better to get a machine that can provide a variety of different functions. While it may be clear that having an in-house sign printer comes with many benefits, it is still important to evaluate whether or not it is the right time to make this purchase. Depending on the size of the company in question needs to be justified, and in some cases it is actually not a good idea. For example, for very small facilities that are on an extremely tight budget, it might be a better option to use third party service for any sign needs they have. While this is more expensive over the long haul, it allows them to get the signs they need at a much lower upfront cost. Ideally, this should only be a short term solution to get a company’s sign needs met, while it is still growing. As the company matures, however, there will come a time when it makes financial sense to invest in a high quality industrial sign printer. Deciding when that point is reached is typically made by balancing out the cost of the printer, with the amount of savings it will bring in over time. Another factor that many companies consider is the added convenience and flexibility. It is often possible to assign a value to the convenience and flexibility that will be enjoyed, and put that into the equation. Every company will have to make this decision based on their unique position, but it is something that should be considered seriously whenever new signs are needed. For many companies it can be difficult to make the move from using a third party service to create the signs they need to purchasing a printer that can handle the job within a facility. This is understandable, but when running a business it is important to consider all the facts of any situation, and make the best decision possible for the long term profitability of the facility. When it comes to being able to create and display signs throughout a facility, having a printer with this capability on site is often the best option. Taking some time to look at all the advantages and disadvantages of having sign making machines on site is well worth it for most facilities. Just about all successful facilities find that at some point, it makes more business sense to have these types of machines available to use on site; the trick is to know when that point occurs. Whether your facility decides to make that move today, or sometime in the future, it should be something that is looked at closely to ensure the facility is operating in the best way possible.